This chapter describes basic concepts that underlie the terminology and rules covered in the rest of this guide. The Script Editor application is located in /Applications/Utilities. It provides the ability to edit, compile, and execute scripts, display application scripting terminologies, and save scripts in a variety of formats, such as compiled scripts, applications, and plain text. Script Editor can display the result of executing an AppleScript script and can display a log of the Apple events that are sent during execution of a script. In the Script Editor Preferences, you can also choose to keep a history of recent results or event logs. Script Editor has text formatting preferences for various types of script text, such as language keywords, comments, and so on. You can also turn on or off the Script Assistant, a code completion tool that can suggest and fill in scripting terms as you type. In addition, Script Editor provides a contextual menu to insert many types of boilerplate script statements, such as conditionals, comments, and error handlers. A dictionary is the part of a scriptable application that specifies the scripting terms it understands. You can choose File > Open Dictionary in Script Editor to display the dictionary of a scriptable application or scripting addition on your computer. Or you can drag an application icon to the Script Editor icon to display its dictionary (if it has one). To display a list that includes just the scriptable applications and scripting additions provided by macOS, choose Window > Library. Double-click an item in the list to display its dictionary. 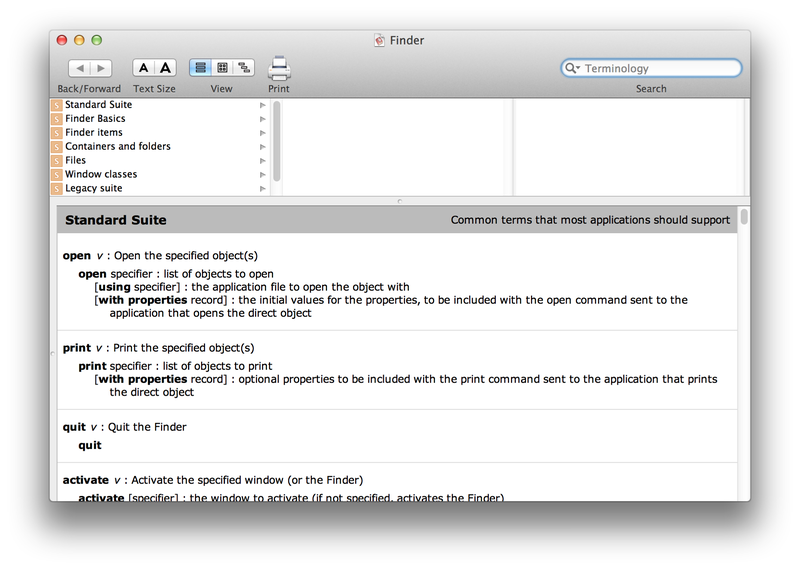 Figure 2-1 shows the dictionary for the Finder application in OS X v10.5. The dictionary is labeled as “Finder.sdef”. The sdef format, along with other terminology formats, is described in “Specifying Scripting Terminology” in AppleScript Overview. There are also third-party editors for AppleScript. AppleScript is an object-oriented language. When you write, compile, and execute scripts, everything you work with is an object. An object is an instantiation of a class definition, which can include properties and actions. AppleScript defines classes for the objects you most commonly work with, starting with the top-level script object, which is the overall script you are working in. AppleScript defines classes for boolean values, scripts, text, numbers, and other kinds of objects for working in scripts; for a complete list, see Class Reference. Scriptable parts of macOS and applications distributed with it, such as Finder, System Events, and Database Events (located in /System/Library/CoreServices), define many useful classes. Third-party scriptable applications define classes that support a wide variety of features. When you enter AppleScript statements in script window in Script Editor, you are working in a top-level script object. All script object definitions follow the same syntax, except that a top-level script object does not have statements marking its beginning and end. A property is a labeled container in which to store a value. An implicit run handler consists of any statements outside of any contained handlers or script objects. property defaultClientName : "Mary Smith"
run testGreet --result: "Hello Mary Smith!" greetClient("Joe Jones") --result: "Hello Joe Jones!" The first statement in the run handler is run testGreet, which runs the nested script object testGreet. That script object calls the handler greetClient(), passing the property defaultClientName. The handler displays a dialog, greeting the default client, Mary Smith. The second statement in the run handler calls greetClient() directly, passing the string "Joe Jones". A property of an object is a characteristic that has a single value and a label, such as the name property of a window or the month property of a date. The definition for any AppleScript class includes the name and class for each of its properties. Property names must be unique within a class. Property values can be read/write or read only. The AppleScript date class, for example, defines both read/write and read only properties. These include the weekday property, which is read only, and the month, day, and year properties, which are read/write. That’s because the value of the weekday property depends on the other properties—you can’t set an arbitrary weekday for an actual date. The class of a property can be a simple class such as boolean or integer, a composite class such as a point class (made up of two integers), or a more complex class. Most classes only support predefined properties. However, for the script class, AppleScript lets you to define additional properties. For information on how to do this, see Defining Properties. You can also define properties for record objects. An element is an object contained within another object. The definition for any AppleScript class includes the element types it can contain. An object can typically contain zero or more of each of its elements. For a given element type, an object can contain many elements or none, and the number of elements that it contains may change over time. For example, it is possible for a list object to contain no items (it can be an empty list). At a later time, the same list might contain many items. set end of myList to "four"
An object specifier specifies the information needed to find another object in terms of the objects in which it is contained. An object specifier can refer to an application object, such as a window or file, or to an AppleScript object, such as an item in a list or a property in a record. An object specifier is fully evaluated (or resolved) only when a script is run, not when it is compiled. A script can contain a valid object specifier (such as third document of application "TextEdit" that causes an error when the script is executed (because, for example, there may be less than three documents open). Applications typically return object specifiers in response to commands. For example, if you ask the Finder for a window, it returns information that specifies the window object your script asked for (if it exists). The top-level container in an object specifier is typically the application itself. You create an object specifier every time your script uses a phrase that describes the path to an object or property, such as name of window 1 of application "Finder". When you use the a reference to operator, it creates a reference object that wraps an object specifier. The difference between an object specifier and the object it refers to is like the difference between a building address and the building itself. The address is a series of words and numbers, such as “2121 Oak Street, San Francisco, CA” that identifies a location (on a street, in a city, in a state). It is distinct from the building itself. If the building at that location is torn down and replaced with a new building, the address remains the same. An object specifier describes an object type, a location, and how to distinguish the object from other objects of the same type in that location. These three types of information—the type, or class; the location, or container; and the distinguishing information, or reference form—allow you to specify any object. In the following example, the class of the object is paragraph. The container is the phrase of document 1. Because this phrase is inside a tell statement, the tell statement provides the top-level container, of application "TextEdit". The distinguishing information (the reference form) is the combination of the class, paragraph, and an index value, 1, which together indicate the first paragraph. Note: If you examine the dictionary for the TextEdit application, you might think this script should say paragraph 1 of text of document 1. However, where the meaning is unambiguous, some applications make life easier for scripters by allowing them to omit a container from an object specifier. TextEdit uses this feature in supplying an implicitly specified subcontainer for the text in a document. That is, if an object specifier identifies an object, such as a word or paragraph, that is contained in a document’s text, TextEdit automatically supplies the of text part of the object specifier. In addition to the index reference form, you can specify objects in a container by name, by range, by ID, and by the other forms described in Reference Forms. In this example, the target of the tell statement ("TextEdit") is the outer container for the object specifier. version of application "Finder" --result: "10.5.1"
When AppleScript encounters a relative object specifier in a tell statement, it attempts to use the default target specified by the statement to complete the object specifier. Though it isn’t generally needed, this implicit target can be specified explicitly using the keyword it, which is described in The it and me Keywords. The default target of a tell statement is the object that receives commands if no other object is specified. For example, the following tell statement tells the Finder to get a name using the previous relative object specifier. When AppleScript encounters a relative object specifier outside any tell statement, it tries to complete the object specifier by looking up the inheritance chain described in Inheritance in Script Objects. --result: document 1 of application "TextEdit"
name of docRef --result: "New Report.rtf"
In this script, the variable docRef is a reference whose object specifier refers to the first document of the application TextEdit—which happens to be named “New Report.rtf” in this case. However, the object that docRef refers to can change. If you open a second TextEdit document called “Second Report.rtf” so that its window is in front of the previous document, then run this script again, it will return the name of the now-frontmost document, “Second Report.rtf”. set docRef to a reference to document "New Report.rtf"
--result: document "New Report.rtf" of application "TextEdit"
If you run this script after opening a second document, it will still return the name of the original document, “New Report.rtf”, if the document exists. After you create a reference object with the a reference to operator, you can use the contents property to get the value of the object that it refers to. That is, using the contents property causes the reference’s object specifier to be evaluated. In the following script, for example, the content of the variable myWindow is the window reference itself. set myWindow to a ref to window "Q1.rtf" of application "TextEdit"
Note that the result of the get command is to return the reference’s object specifier, not to resolve the specifier to the object it specifies. set myWindow to a ref to window 1 of application "TextEdit"
For related information, see the Discussion section for the reference class. Not all classes can be coerced to all other class types. Table 2-1 summarizes the coercions that AppleScript supports for commonly used classes. For more information about each coercion, see the corresponding class definition in Class Reference. AppleScript provides many coercions, either as a built-in part of the language or through the Standard Additions scripting addition. You can use these coercions outside of a tell block in your script. However, coercion of application class types may be dependent on the application and require a tell block that targets the application. If you provide a command parameter or operand of the wrong class, AppleScript automatically coerces the operand or parameter to the expected class, if possible. If the conversion can’t be performed, AppleScript reports an error. When coercing text strings to values of class integer, number, or real, or vice versa, AppleScript uses the current Numbers settings in the Formats pane in International preferences to determine what separators to use in the string. When coercing strings to values of class date or vice versa, AppleScript uses the current Dates settings in the Formats pane. This is both an AppleScript class and an application class. Coercing an integer to a number does not change its class. Values identified as values of class number are really values of either class integer or class real. POSIX file is a pseudo-class equivalent to the file class. In coercing to integer, any fractional part is rounded. Coercing a real to a number does not change its class. All labels are lost in the coercion and the resulting list cannot be coerced back to a record. Can coerce to integer or real only if the text object represents an appropriate number. Can coerce between unit types in the same category, such as inches to kilometers (length) or gallons to liters (liquid volume). A scripting addition is a file or bundle that provides handlers you can use in scripts to perform commands and coercions. Many of the commands described in this guide are defined in the Standard Additions scripting addition in macOS. These commands are stored in the file StandardAdditions.osax in /System/Library/ScriptingAdditions, and are available to any script. You can examine the terminology for the Standard Additions by opening this file in Script Editor. Scripting additions can be embedded within bundled script applets by placing them in a folder named Scripting Additions (note the space between “Scripting” and “Additions”) inside the bundle’s Contents/Resources/ folder. Note that Script Editor does not look for embedded scripting additions when editing bundled applets. During script development, any required scripting additions must be properly installed in /System/ScriptingAdditions, /Library/ScriptingAdditions, or ~/Library/ScriptingAdditions so that Script Editor can find them. Developers can create their own scripting additions, as described in Technical Note TN1164, Scripting Additions for Mac OS X. For related conceptual information, see AppleScript Overview, particularly the section “Extending AppleScript with Coercions, Scripting Additions, and Faceless Background Applications” in the chapter Open Scripting Architecture. A command is a word or a series of words used in AppleScript statements to request an action. Every command is directed at a target, which is the object that responds to the command. The target is often an application object (one that is stored in an application or its documents and managed by the application, such as a window or document) or an object in macOS. However, it can also be a script object or a value in the current script. Commands often return results. For example, the display dialog command returns a record that may contain text, a button name, and other information. Your script can examine this record to determine what to do next. You can assign the result of a command to a variable you define, or access it through the predefined AppleScript result variable. An AppleScript command is one that is built into the AppleScript language. There currently are five such commands: get , set, count, copy, and run. Except for copy , each of these commands can also be implemented by applications. That is, there is an AppleScript version of the command that works on AppleScript objects, but an application can define its own version that works on the object types it defines. A scripting addition command is one that is implemented through the mechanism described in Scripting Additions). Although anyone can create a scripting addition (see Technical Note TN1164, Scripting Additions for Mac OS X), this guide documents only the scripting addition commands from the Standard Additions, supplied by Apple as part of macOS. These commands are available to all scripts. A user-defined command is one that is implemented by a handler defined in a script object. To invoke a user-defined command outside of a tell statement, simply use its name and supply values for any parameters it requires. The command will use the current script as its target. To invoke a user-defined command inside a tell statement, see Calling Handlers in a tell Statement. An application command is one that is defined by scriptable application to provide access to a scriptable feature. They are typically enclosed in a tell statement that targets the application. You can determine which commands an application supports by examining its dictionary in Script Editor. Scriptable applications that ship with macOS, such as the Finder and System Events applications (located in /System/Library/CoreServices), provide many useful scripting commands. Third-party scriptable applications also provide commands you can use in scripts. Many support all or a subset of the Standard commands, described in Technical Note TN2106, Scripting Interface Guidelines. These include commands such as delete, duplicate, exists, and move, as well as application implementations of AppleScript commands, such as get and set. There are two ways to explicitly specify an object as the target of a command: by supplying it as the direct parameter of the command (described in the next section) or by specifying it as the target of a tell statement that contains the command. If a script doesn’t explicitly specify the target with a tell statement, and it isn’t handled by a handler in the script or by AppleScript itself, it is sent to the next object in the inheritance chain (see The AppleScript Inheritance Chain). In the following script, the target of the get command is the object specifier name of first window. Because the enclosing tell statement specifies the Finder application, the full specifier is name of first window of application "Finder", and it is the Finder application which obtains and returns the requested information. When a command targets an application, the result may be an application object. If so, subsequent statements that target the result object are sent to the application. extract address from "John Doe <jdoe@example.com>"
The direct parameter is a value, usually an object specifier, that appears immediately next to a command and specifies the target of the command. Not all commands have a direct parameter. If a command can have a direct parameter, it is noted in the command’s definition. duplicate last file of window 1 of application "Finder"
tell last file of window 1 of application "Finder"
Many commands have parameters that specify locations. A location can be either an insertion point or another object. An insertion point is a location where an object can be added. In the following example, the to parameter specifies the location to which to move the first paragraph. The value of the to parameter of the duplicate command is the relative object specifier before paragraph 4, which is an insertion point. AppleScript completes the specifier with the target of the tell statement, front document of application "TextEdit". tell front document of application "TextEdit"
The phrases paragraph 1 and before paragraph 4 are called index and relative references, respectively. For more information, see Reference Forms. During script execution, errors may occur due to interaction with macOS, problems encountered in an application script command, or problems caused by statements in the script itself. When an error occurs, AppleScript stops execution at the current location, signals an error, and looks up the calling chain for script statements that can handle the error. That is, it looks for the nearest error-handling code block that surrounds the location where the error occurred. Scripts can handle errors by enclosing statements that may encounter an error within a try statement. The try statement includes an on error section that is invoked if an error occurs. AppleScript passes information about the error, including an error number and an error message, to the on error section. This allows scripts to examine the error number and to display information about it. If the error occurs within a handler that does not provide a try statement, AppleScript looks for an enclosing try statement where the handler was invoked. If none of the calls in the call chain is contained in a try statement, AppleScript stops execution of the script and displays an error message (for any error number other than -128, described below). A script can use an error statement to signal an error directly. Doing so invokes the AppleScript error handling mechanism, which looks for an enclosing try statement to handle the error. Some “errors” are the result of the normal operation of a command. For example, commands such as display dialog and choose file signal error –128 (User canceled), if the user clicks the Cancel button. Scripts routinely handle the user canceled error to ensure normal operation. For an example of how to do this, see the Examples section for the display dialog command. If no try statement in a script handles the -128 error, AppleScript halts execution of the script without displaying any error message. For related information, see Results, error Statements, try Statements, Error Numbers and Error Messages, and Working with Errors. AppleScript defines a number of global constants that you can use anywhere in a script. The global constant AppleScript provides access to properties you can use throughout your scripts. You can use the AppleScript identifier itself to distinguish an AppleScript property from a property of the current target with the same name, as shown in the section version. The following sections describe additional properties of AppleScript. This mathematical value represents the ratio of a circle's circumference to its diameter. It is defined as a real number with the value 3.14159265359. When a statement is executed, AppleScript stores the resulting value, if any, in the predefined property result. The value remains there until another statement is executed that generates a value. Until a statement that yields a result is executed, the value of result is undefined. You can examine the result in Script Editor by looking in the Result pane of the script window. Note: When an error occurs during script execution, AppleScript signals an error. It doesn’t return error information in the result property. For more information, see AppleScript Error Handling. AppleScript defines the text properties space, tab, return, linefeed, and quote. You effectively use these properties as text constants to represent white space or a double quote (") character. They are described in the Special String Characters section of the text class. AppleScript provides the text item delimiters property for use in processing text. This property consists of a list of strings used as delimiters by AppleScript when it coerces a list to text or gets text items from text strings. When getting text items of text, all of the strings are used as separators. When coercing a list to text, the first item is used as a separator. Note: Prior to OS X Snow Leopard v10.6, AppleScript only used the first delimiter in the list when getting text items. Because text item delimiters respect considering and ignoring attributes in AppleScript 2.0, delimiters are case-insensitive by default. Formerly, they were always case-sensitive. To enforce the previous behavior, add an explicit considering case statement. get last text item of "Hard Disk:CD Contents:Release Notes"
returns the result "Release Notes". If you change the text item delimiters property in Script Editor, it remains changed until you restore its previous value or until you quit Script Editor and launch it again. If you change text item delimiters in a script application, it remains changed in that application until you restore its previous value or until the script application quits; however, the delimiters are not changed in Script Editor or in other script applications you run. This property provides the current version of AppleScript. The following script shows how to check for a version greater than or equal to version 1.9. The if statement is wrapped in a considering numeric strings statement so that an AppleScript version such as 1.10.6 compares as larger than, say, version 1.9.
version of AppleScript --result: "2.0"
The current application constant refers to the application that is executing the current AppleScript script (for example, Script Editor). Because the current application is the parent of AppleScript (see The AppleScript Inheritance Chain), it gets a chance to handle commands that aren’t handled by the current script or by AppleScript. name of current application --result: "Script Editor"
The missing value constant is a placeholder for missing or uninitialized information. AppleScript defines the Boolean constants true and false. These constants are described with the boolean class. AppleScript defines the keyword me to refer to the current script and the keyword it to refer to the current target. (The current script is the one that is currently being executed; the current target is the object that is the current default target for commands.) It also defines my as a synonym for of me and its as a synonym for of it. tell document 1 of application "TextEdit"
For information on using it in a filter reference, see the Discussion section for the Filter reference form. To refer to items and locations in the macOS file system, you use alias objects and file objects. A file object represents a specific file at a specific location in the file system. It can refer to an item that does not currently exist, such as the name and location for a file that is to be created. A file object is not dynamic, and always refers to the same location, even if a different item is moved into that place. The POSIX file pseudo-class is roughly synonymous with file: POSIX file specifiers evaluate to a file object, but they use different semantics for the name, as described in Specifying Paths. Use an alias object to refer to existing file system objects. Use a file object to refer to a file that does not yet exist. Use a POSIX file specifier if you want to specify the file using a POSIX path. The following sections describe how to specify file system objects by path and how to work with them in your scripts. You can create alias objects and file objects by supplying a name specifier, where the name is the path to an item in the file system. For alias and file specifiers, the path is an HFS path, which takes the form "disk:item:subitem:subsubitem:...:item". For example, "Hard_Disk:Applications:Mail.app" is the HFS path to the Mail application, assuming your boot drive is named "Hard_Disk". HFS paths with a leading colon, such as ":folder:file", are resolved relative to the HFS working directory. However, their use is discouraged, because the location of the HFS working directory is unspecified, and there is no way to control it from AppleScript. For POSIX file specifiers, the path is a POSIX path, which takes the form "/item/subitem/subsubitem/.../item". The disk name is not required for the boot disk. For example, "/Applications/Mail.app" is the POSIX path to the Mail application. You can see the POSIX path of an item in Finder in the "Where" field of its Get Info window. Despite the name, POSIX file specifiers may refer to folders or disks. Use of "~" to specify a home directory is not supported. POSIX paths without a leading slash, such as "folder/file", are resolved relative to the POSIX working directory. This is supported, but only is useful for scripts run from the shell—the working directory is the current directory in the shell. The location of the POSIX working directory for applications is unspecified. AppleScript defines the alias class to represent aliases. An alias can be stored in a variable and used throughout a script. The following script first creates an alias to an existing file in the variable notesAlias, then uses the variable in a tell statement that opens the file. It uses a try statement to check for existence of the alias before creating it, so that the alias is only created once, even if the script is run repeatedly. set notesAlias to alias "Hard_Disk:Users:myUser:Feb_Notes.rtf"
Finding the object an alias refers to is called resolving an alias. AppleScript 2.0 attempts to resolve aliases only when you run a script. However, in earlier versions, AppleScript attempts to resolve aliases at compile time. notesAlias as text --result: "Hard_Disk:Users:myUser:Feb_Notes.rtf"
POSIX path of notesAlias --result: "/Feb_Notes.rtf"
If an alias doesn’t refer to an existing file system object then it is broken. You can’t create an alias to an object that doesn’t exist, such as a file you plan to create. For that you use a file object, described in the next section. For a sample script that shows how a script application can process a list of aliases it receives when a user drops one or more file icons on it, see open Handlers. set notesFile to POSIX file "/Users/myUser/Feb_Meeting_Notes.rtf"
set newFile to POSIX file "/Users/myUser/BrandNewFile.rtf"
Similarly, you can let a user specify a new file with the choose file name command, then use the returned file object to create the file. In the following example, if the user cancels the choose file name dialog, the rest of the script is not executed. If the user does supply a file name, the script opens the file, creating it if necessary, then uses a try statement to make sure it closes the file when it is finished writing to it. Typically, when you pass a file object to a command that uses it to operate on a new or existing item in the file system, the components of the path must exist for the command to succeed. A script can target an application on a remote computer if remote applications are enabled on that computer, and if the script specifies the computer with an eppc-style specifier. The computer that contains the application and the computer on which the script is run must be connected to each other through a network. Remote Apple Events (set in the Sharing preferences pane) must be enabled on the remote computer and user access must be provided (you can allow access for all users or for specified users only). If the specified remote application is not running, you must run it. You must authenticate as admin when you compile or run the script. Either a numeric IP address in dotted decimal form (four numbers, from 0 to 255, separated by periods; for example, 123.23.23.123) or a hostname. A hostname can be a Bonjour name. The following are examples of valid eppc-style specifiers. If you supply the user name and password, no authentication is required. If you do not supply it, authentication may be required. You can target an application that is running on a remote machine and you can launch applications on remote machines that are not currently running. The following example uses an eppc-style specifier to target the Finder on a remote computer. It includes a user name and password, so no authentication is required. Important: If you compile an erroneous eppc-style address, you will have to quit and relaunch Script Editor for changes to that address to take effect. open application file id "com.apple.TextEdit"
If you omit the password (pwd) in the previous script, you will have to authenticate when you run the script. AppleScript does not include a built-in debugger, but it does provide several simple mechanisms to help you debug your scripts or just observe how they are working. beep 3 -- three beeps; a very important part of the script! Script Editor can display a log of the Apple events that are sent during execution of a script. In the Script Editor Preferences, you can also choose to keep a history of recent results or event logs. In addition, you can insert log statements into a script. Log output is shown in the Event Log pane of a script window, and also in the Event Log History window, if it is open. set wordList to words in "Where is the hammer?" display dialog "I found the hammer!" If you need full-featured debugging capabilities, there are powerful, third-party AppleScript debuggers available.